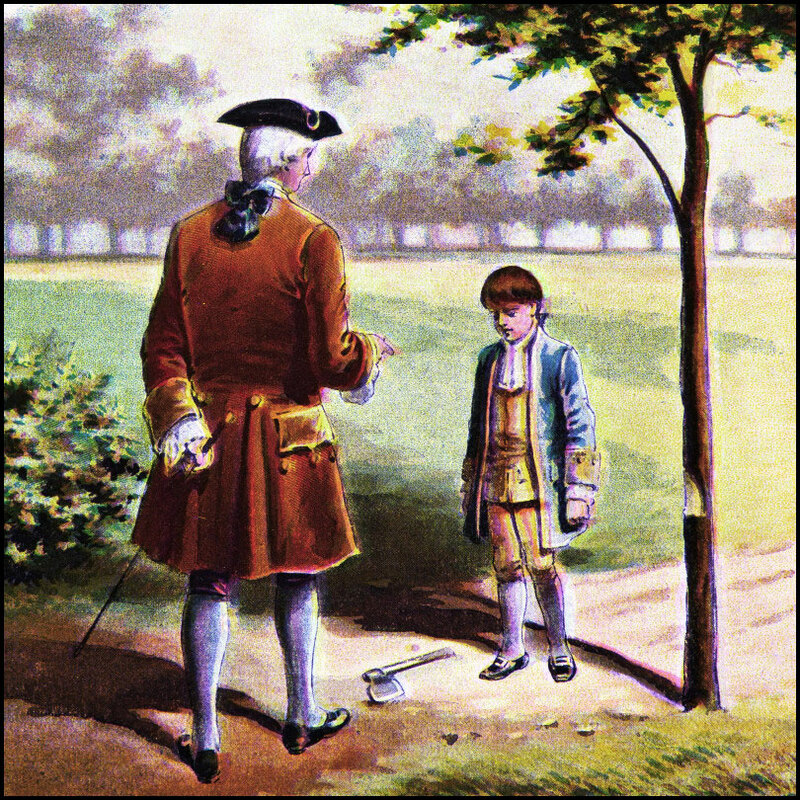 On this date in 1732, the first President of the United States was born. 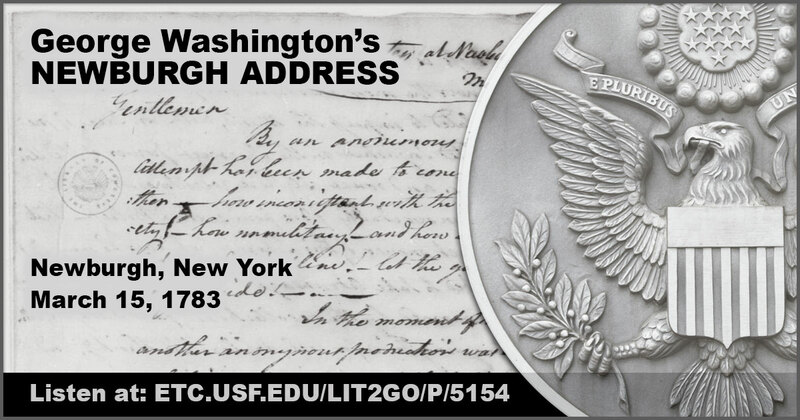 Our collection of teaching resources includes historic illustrations, photos of sculptures and memorials, maps, and audiobook renditions of many of Washington’s speeches. 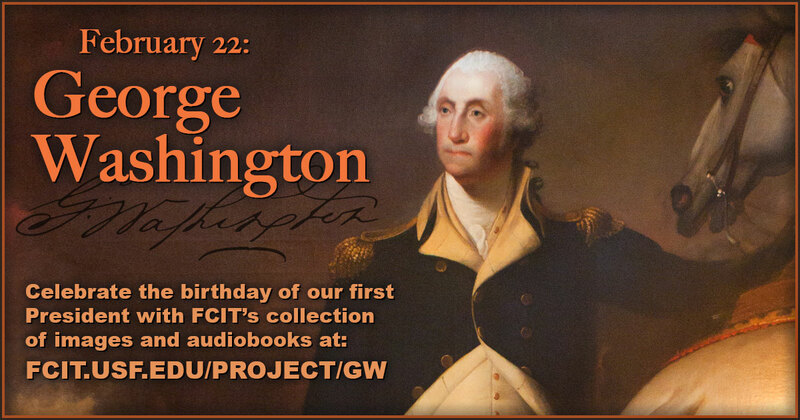 Use this banner on social media to share our George Washington teaching collection. 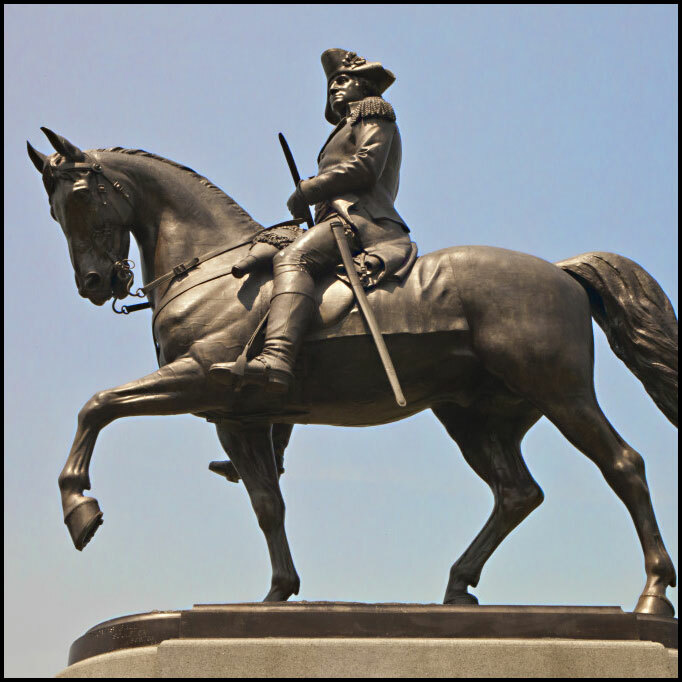 Washington on horseback from the ClipPix ETC website. The statue is located in he Boston Public Garden. Another view. A bronze statue of a young George Washington at Kennywood Park, near Pittsburgh, PA. 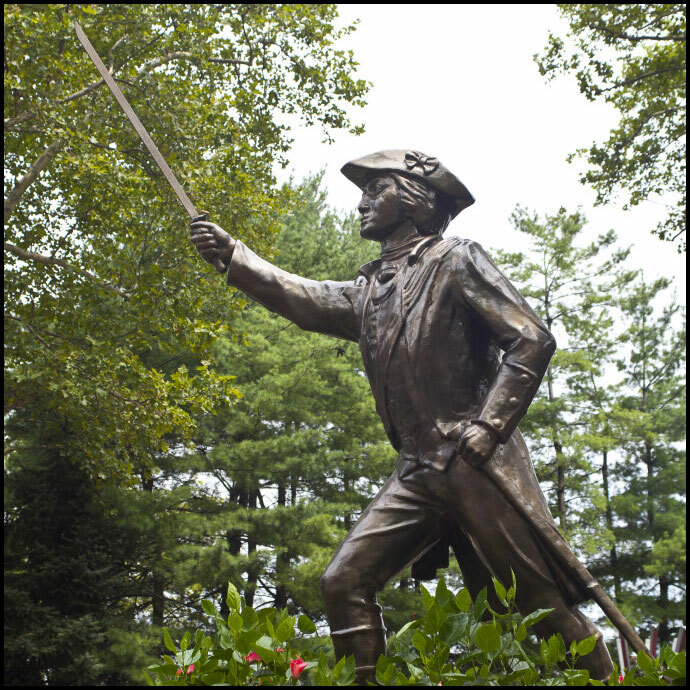 The 23 year old Virginia militia colonel led British troops back to Maryland through the area during the French and Indian War. Photo from the ClipPix ETC website. Another view. 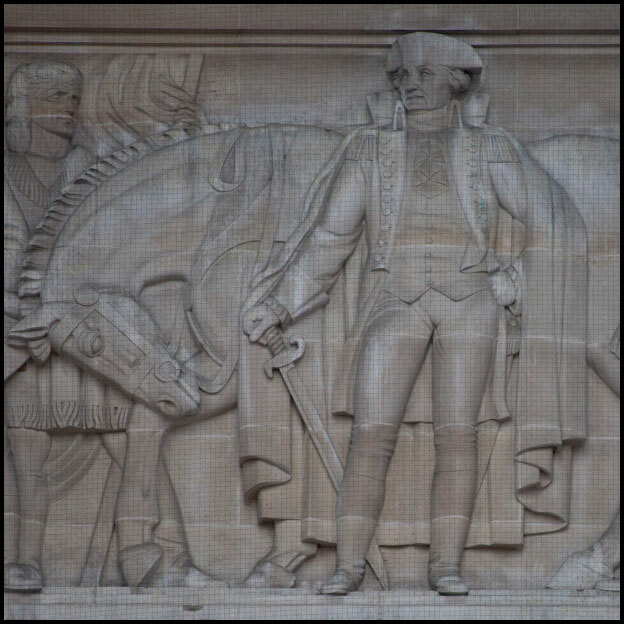 Stone relief of George Washington standing in front of a horse at the EPA Building, Washington DC. Photo from the ClipPix ETC website. 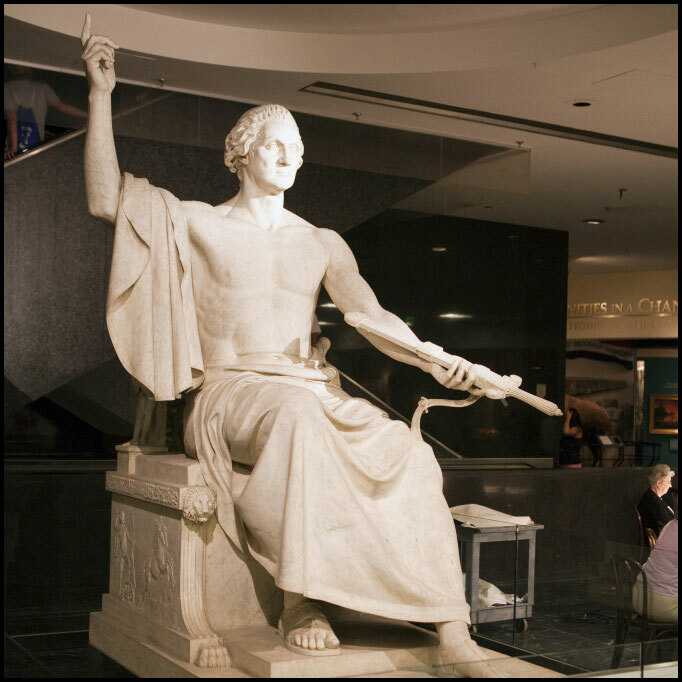 This statue, commissioned by Congress in 1832 and completed in 1841 by Horatio Greenough is intended to be a symbolic representation of George Washington as a great exemplar of liberty. Photo from the ClipPix ETC website. A close-up view. 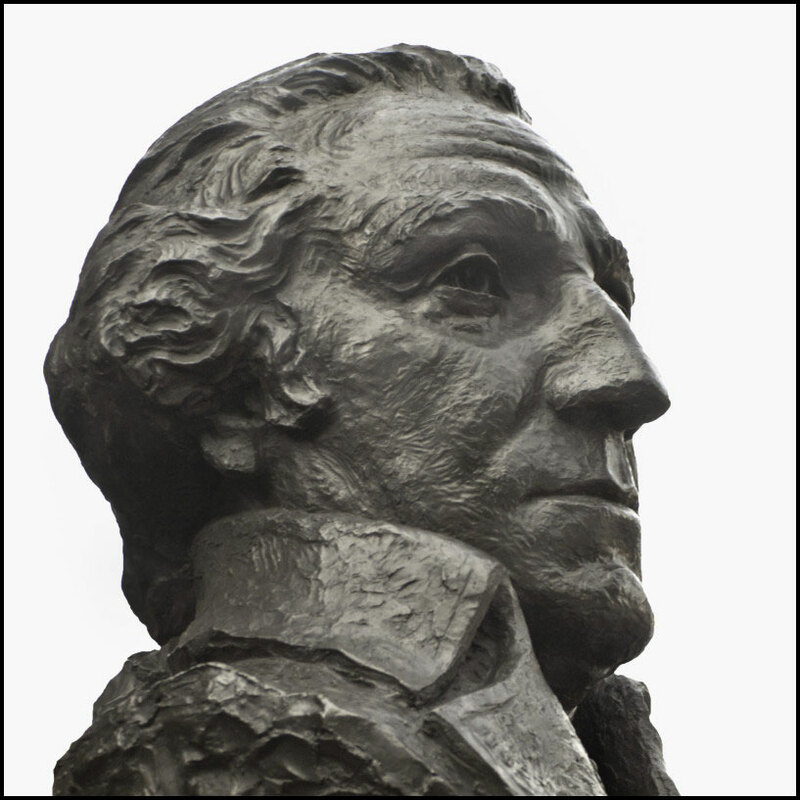 A bust of George Washington outside of George Washington University, Washington DC from the ClipPix ETC website. Another view with background. 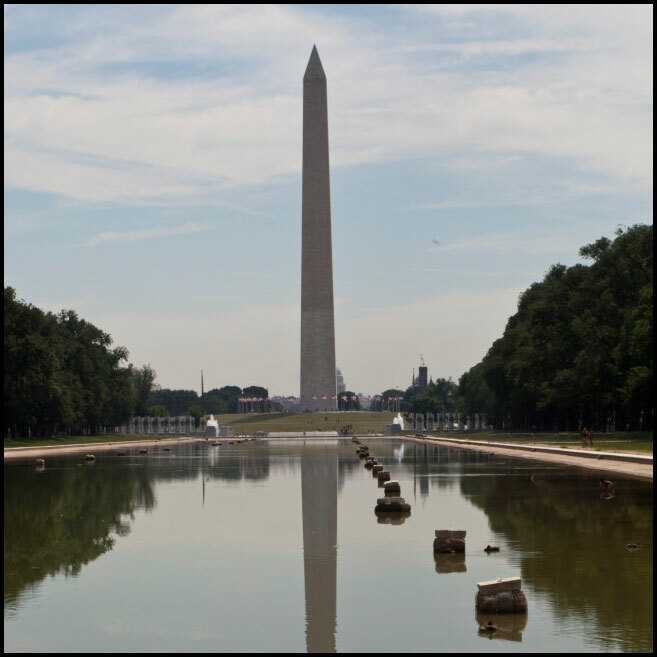 A gallery of several dozen photos of the Washington Monument from the ClipPix ETC website. 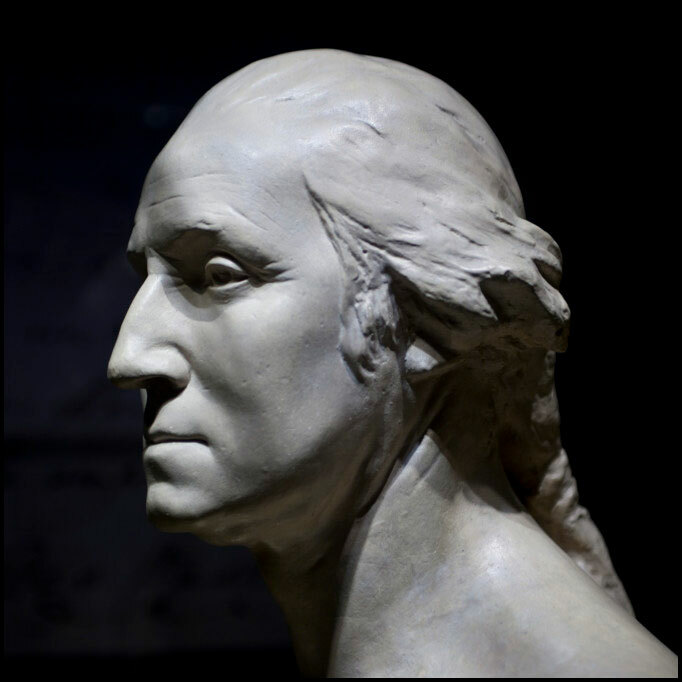 A bust made by Clark Mills in 1853 using the original life-cast of Washington’s face taken by Jean-Antoine Houdon at Mount Vernon, 1785. Located in the National Museum of American History. 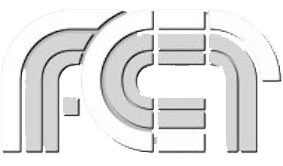 Photofrom the ClipPix ETC website. Front view of same sculpture. 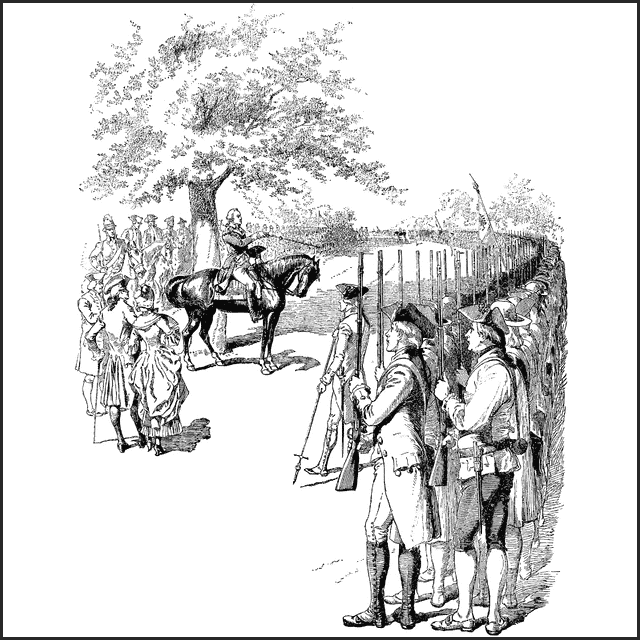 George Washington addresses the officers at Newburgh in an attempt to prevent a possible uprising. Available on the Lit2Go website. Reading level: 12.0. Word count: 1,136. 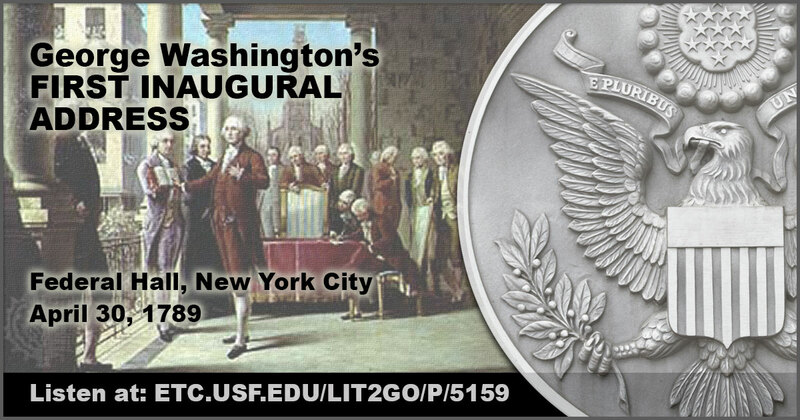 George Washington’s first inaugural address delivered at Federal Hall in New York City, April 30, 1789. Available on the Lit2Go website. Reading level: 12.0. Word count: 1,438. 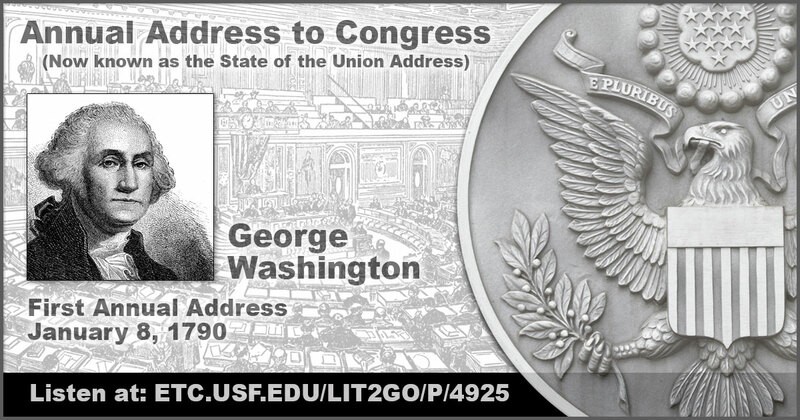 Washington’s eight annual messages to Congress are available from the Lit2Go website. Such messages are now known as State of the Union Addresses. 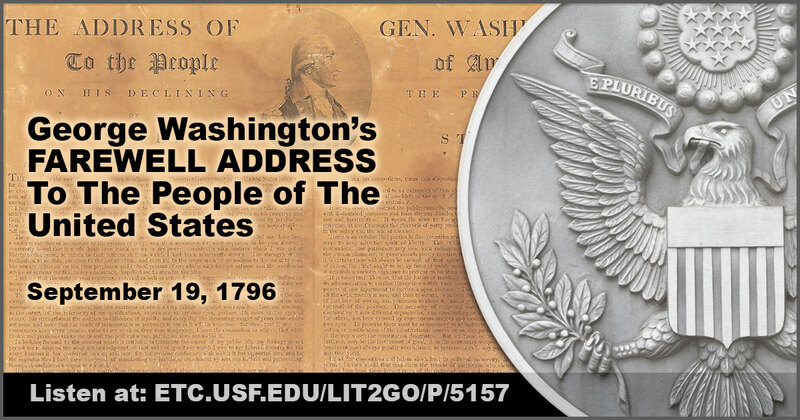 George Washington’s Farewell Address was written to “The People of the United States” near the end of his second term as President of the United States and before his retirement to Mount Vernon. Available on the Lit2Go website. Reading level: 12.0. Word count: 6,083. Since the American Revolution, Congress has commissioned gold medals as its highest expression of national appreciation for distinguished achievements and contributions. Each medal honors a particular individual, institution, or event. The medal was first awarded in 1776 by the Second Continental Congress to then-General George Washington during the American Revolutionary War. Illustration from the ClipArt ETC website. Illustration of back of medal. 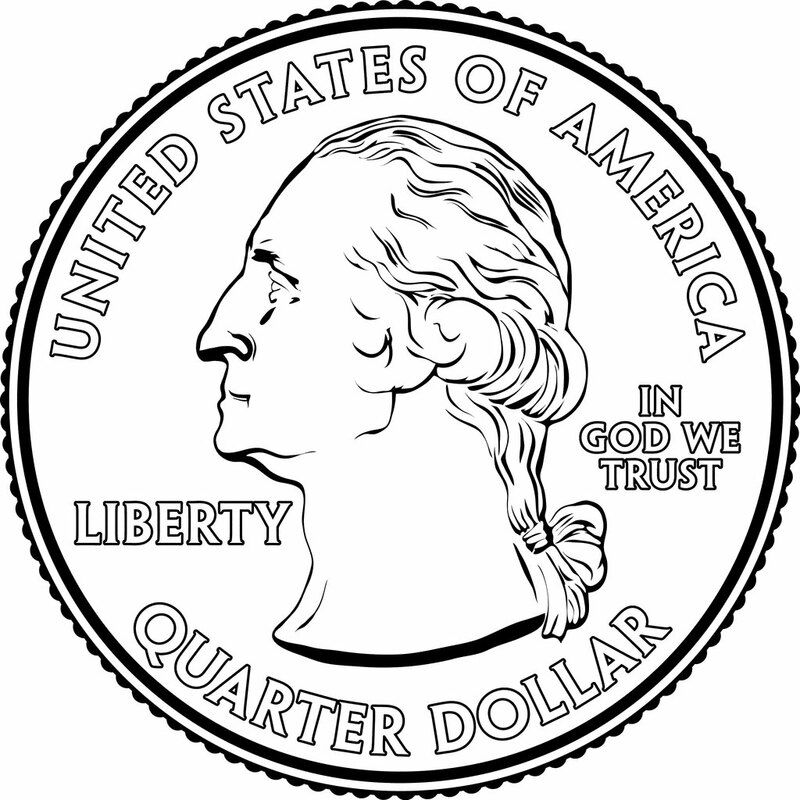 Front of a Washington quarter from the ClipPix ETC website. 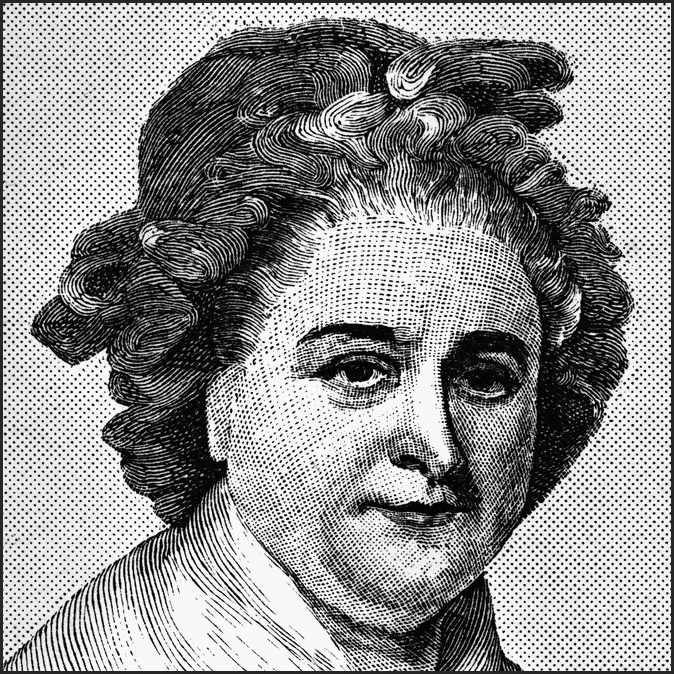 Martha Washington, the wife of George Washington, the first president of the United States. Considered to be the first First Lady of the United States. Illustration from the ClipArt ETC website. Mary Ball Washington (1708 – 1789) was the mother of George Washington. 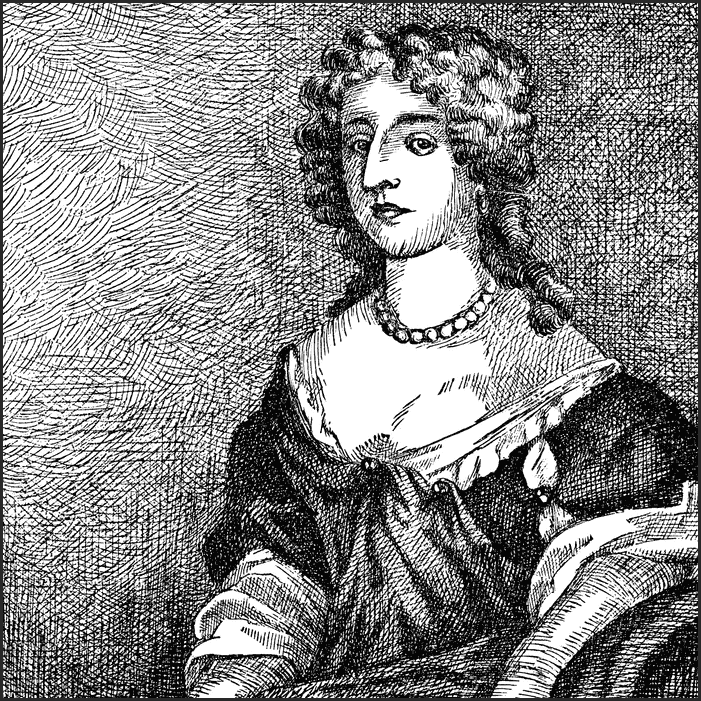 Mary Ball met Augustine Washington and they married in 1730. Together, Mary and Augustine had six children. Illustration from the ClipArt ETC website. 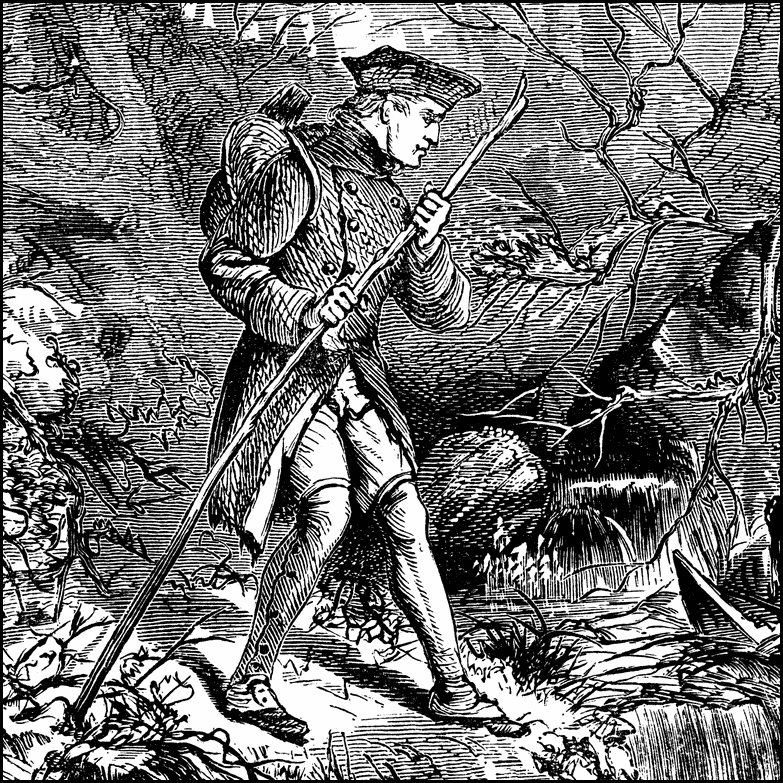 An illustration of a young George Washington trekking through the wilderness. Illustration from the ClipArt ETC website. Although he did not explicitly seek the office of commander and even claimed that he was not equal to it, there was no serious competition. Congress created the Continental Army on June 14, 1775; the next day, on the nomination of John Adams of Massachusetts, Washington was appointed Major General and elected by Congress to be Commander-in-chief. Illustration from the ClipArt ETC website. 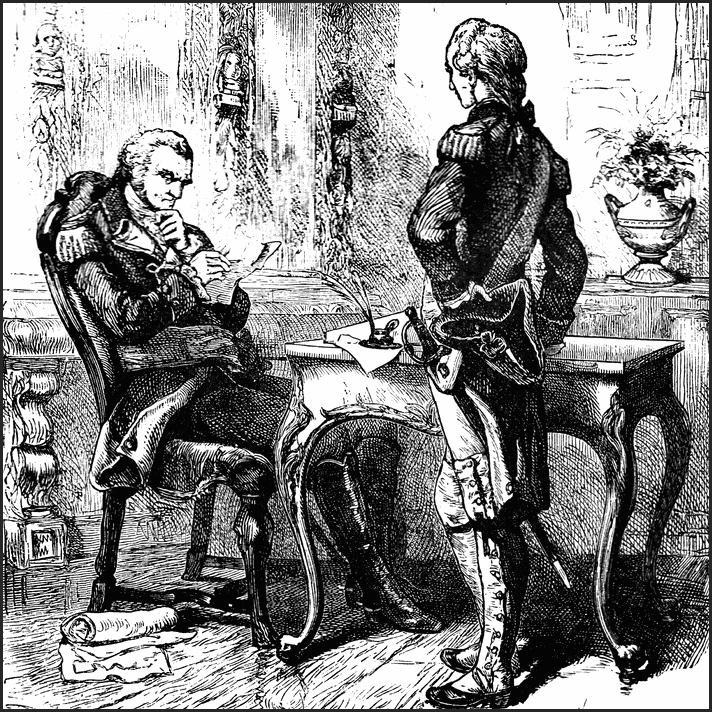 Lafayette and Washington meeting during the American Revolution. Illustration from the ClipArt ETC website. 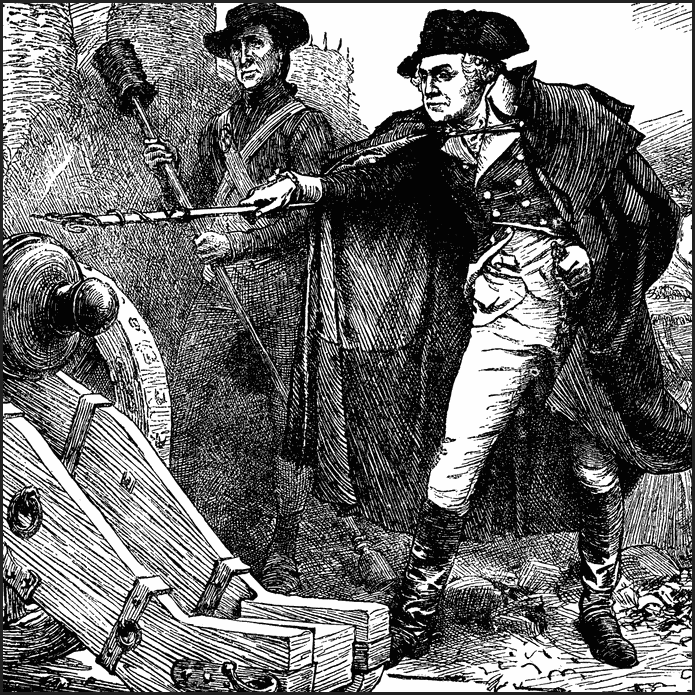 An illustration of George Washington lighting a cannon at the siege of Yorktown. from the ClipArt ETC website. 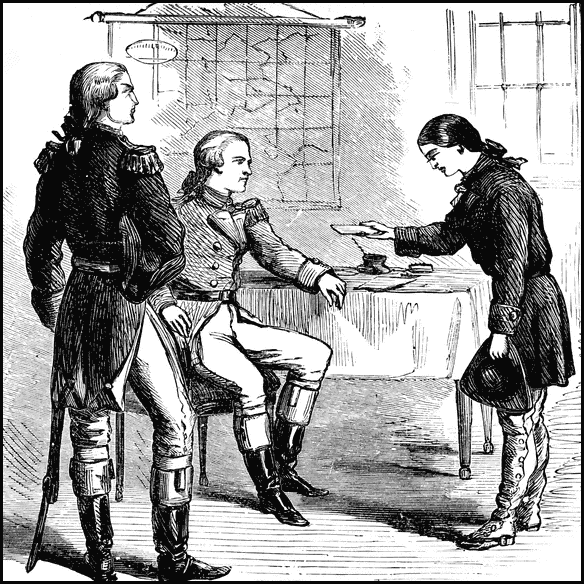 Simpson, a woman who masqueraded as a male soldier, presents a letter to General Washington. Illustration from the ClipArt ETC website. 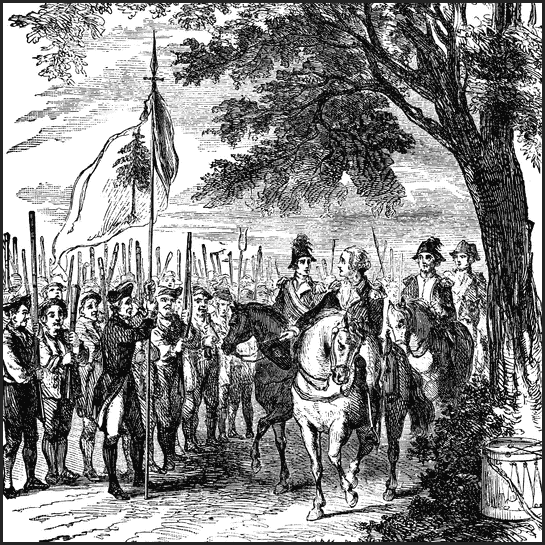 An illustration of George Washington on horseback commanding the American army. He is lining up the army and getting them ready for battle. Illustration from the ClipArt ETC website. 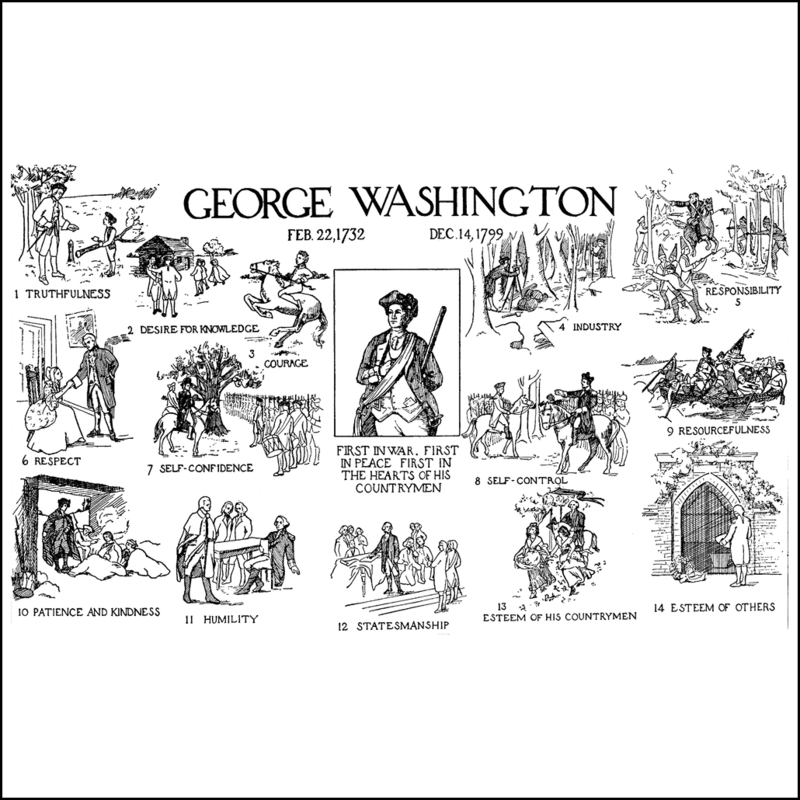 Poster illustrating George Washington’s exemplary character in a series of sketches from his life. Illustration from the ClipArt ETC website. 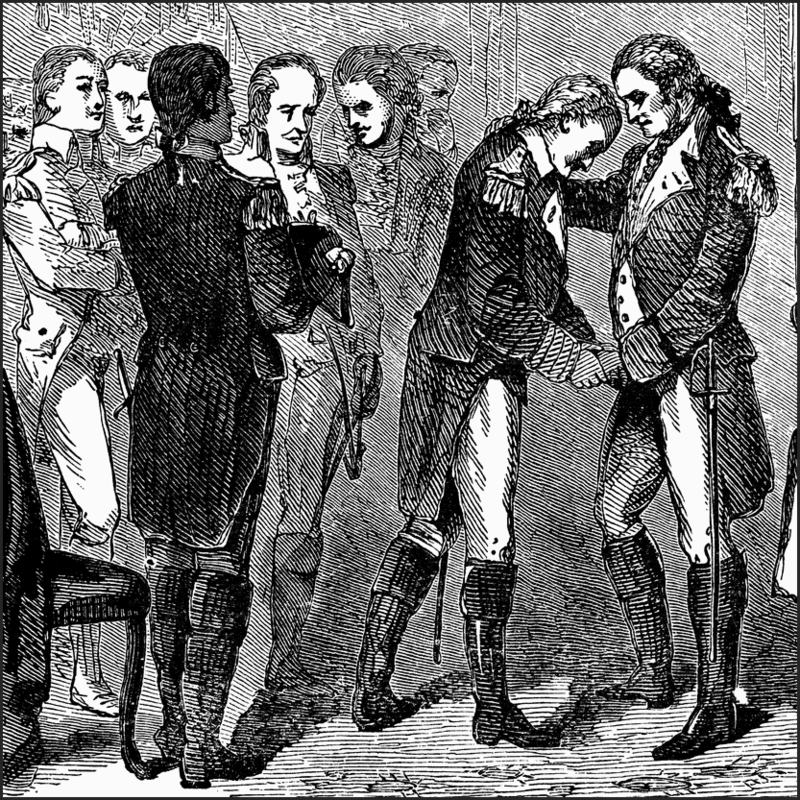 General Washington’s farewell to his officers. Illustration from the ClipArt ETC website. A map of New Jersey and Pennsylvania showing the campaigns of General George Washington in the area between 1776 and 1778. 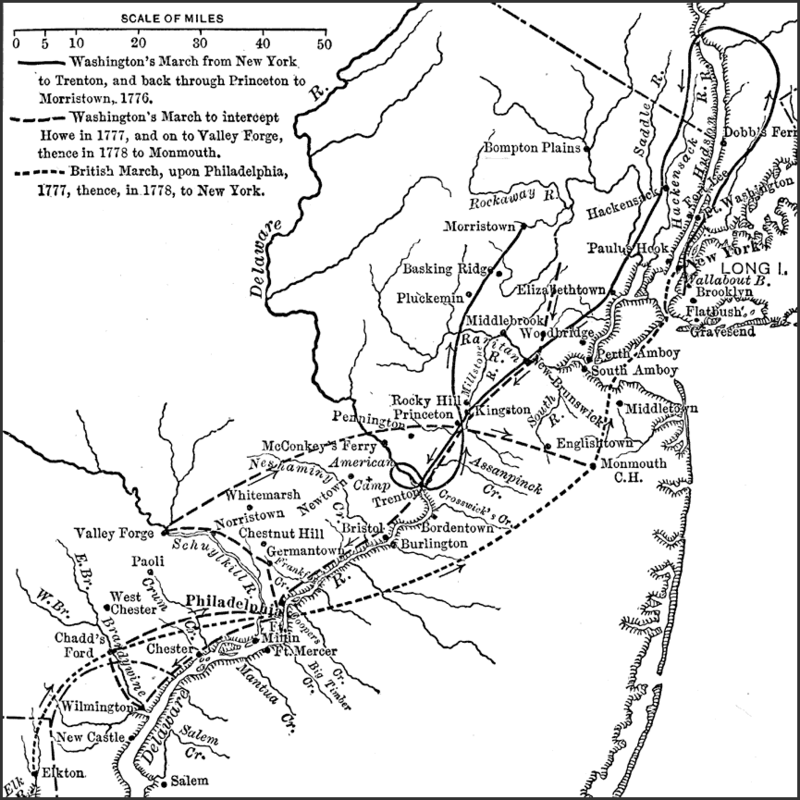 The map is keyed to show the route of Washington’s March from New York to Trenton and back through Princeton to Morristown (1776), Washington’s March to intercept Howe in 1777, Valley Forge and Monmouth (1778), and the British March from Elkton to Philadelphia and then to New York. One of dozens of battle maps related to Washington from the Early America section of the Maps ETC website. A map of the area around Valley Forge and Philadelphia, site of several important operations during the American Revolution, including Washington’s crossing of the Delaware near Trenton (1776), Wilmington, the British landing site under Howe at the Elk River (1777), the American defensive position at Chadd’s Ford on the Brandywine River, retreat to Westchester and Philadelphia, the battle site near Paoli, the crossing of Schuylkill River at Norristown by Howe on his march to Philadelphia, the British encampment at Germantown, Fort Mercer, Fort Mifflin, and Valley Forge on the right bank of the Schuylkill, the winter quarters of Washington (1777–1778). One of dozens of battle maps related to Washington from the Early America section of the Maps ETC website. 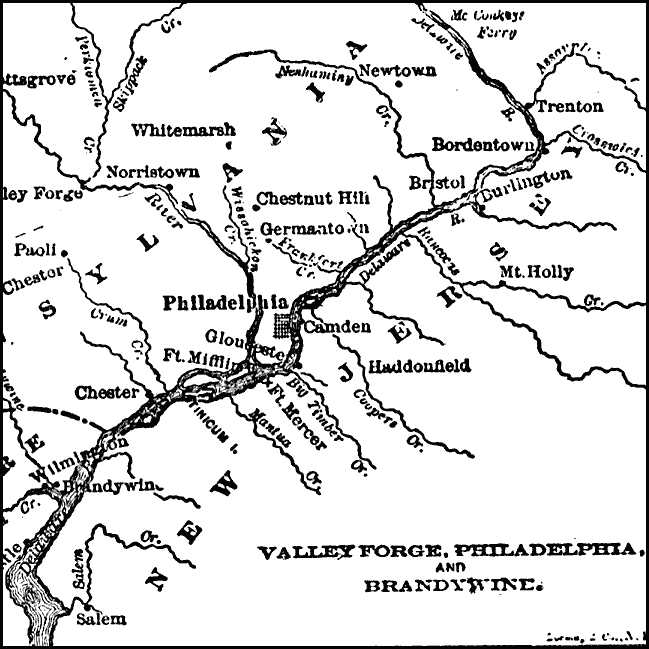 A map of the area in Pennsylvania south of Philadelphia detailing the Battle of Brandywine during the American Revolution (September 11, 1777). 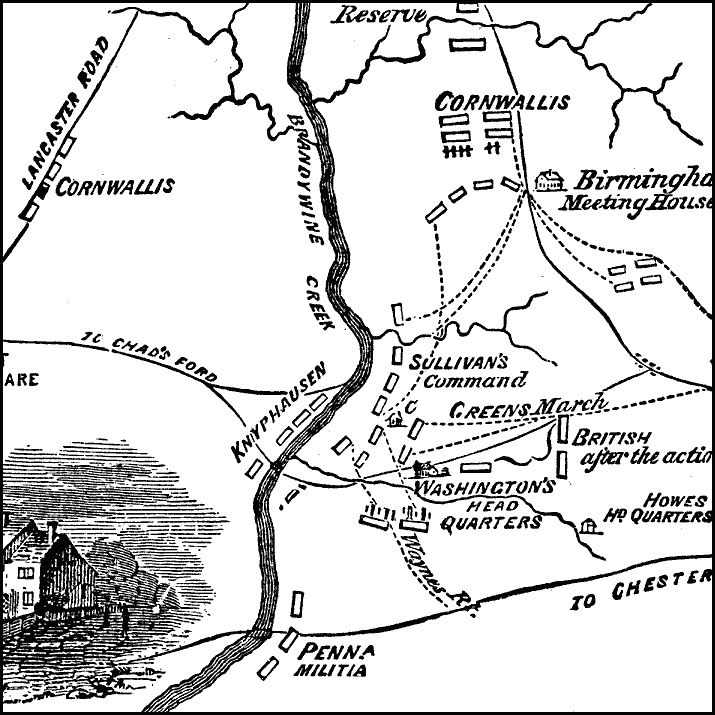 The map shows the battle site of Chad’s Ford, the Lancaster Road, the British and American positions, the headquarters of Washington at the onset of the battle and British commander Howe at the end, and the routes of Green’s march and Sullivan’s command during the battle. One of dozens of battle maps related to Washington from the Early America section of the Maps ETC website. A map of the Colonial Virginia area where the Siege of Yorktown took place in 1781. 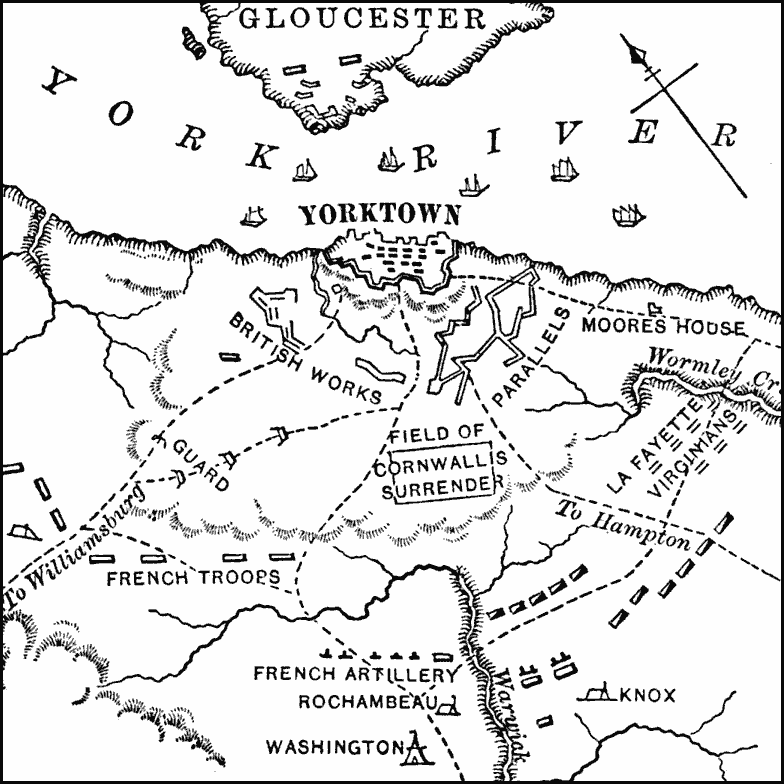 The map shows the British held city of Yorktown on the York River, the city of Gloucester, the British works, redoubts, and fortifications, roads to Hampton and Williamsburg, the American control of the York River by the fleet under the Comte de Grasse, the positions of the French troops, headquarters, and artillery under the Comte de Rochambeau, the positions and headquarters of the American troops under Washington and Knox, the position of the Virginians under La Fayette, the Moore’s House where initial surrender negotiations took place, and the field of the surrender of Charles Cornwallis. One of dozens of battle maps related to Washington from the Early America section of the Maps ETC website. 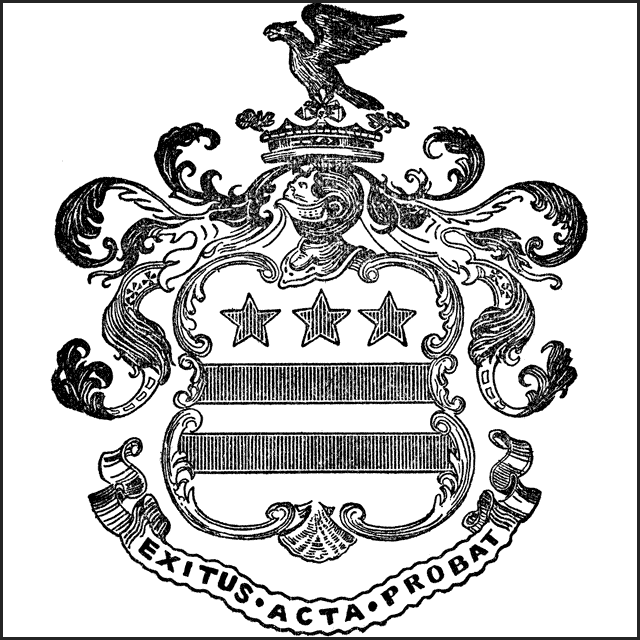 The Coat of Arms of George Washington’s family. It is said to be in inspiration of the stars and stripes on the flag of the United States. Illustration from the ClipArt ETC website. 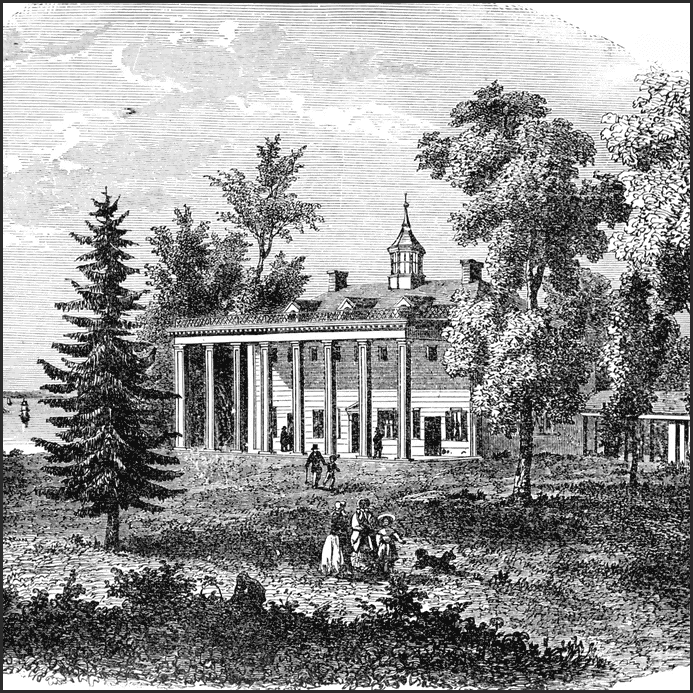 Ferry Farm, also known as George Washington Boyhood Home Site or Ferry Farm Site, is the name of the farm and home at which George Washington spent much of his childhood. 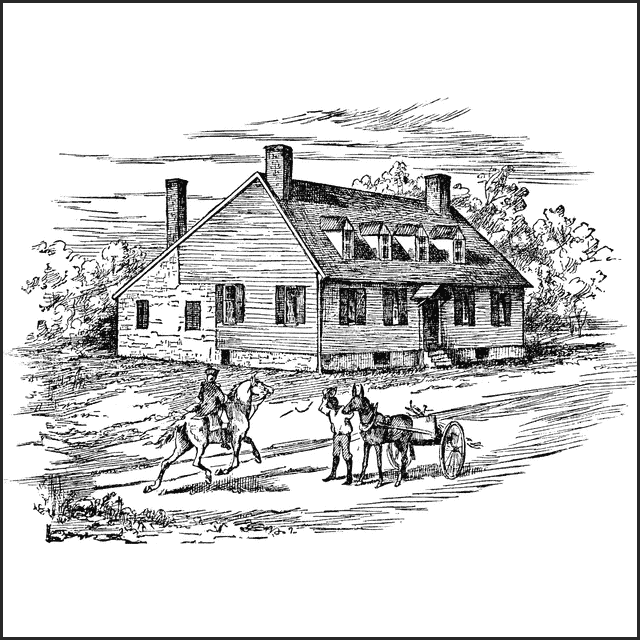 In July 2008, archeologists announced that they had found remains of the boyhood home, which had burnt in a fire, including artifacts such as pieces of a tea set probably belonging to George’s mother, Mary Ball Washington. Illustration from the ClipArt ETC website. Mount Vernon, the home of George Washington. Illustration from the ClipArt ETC website. Another view. 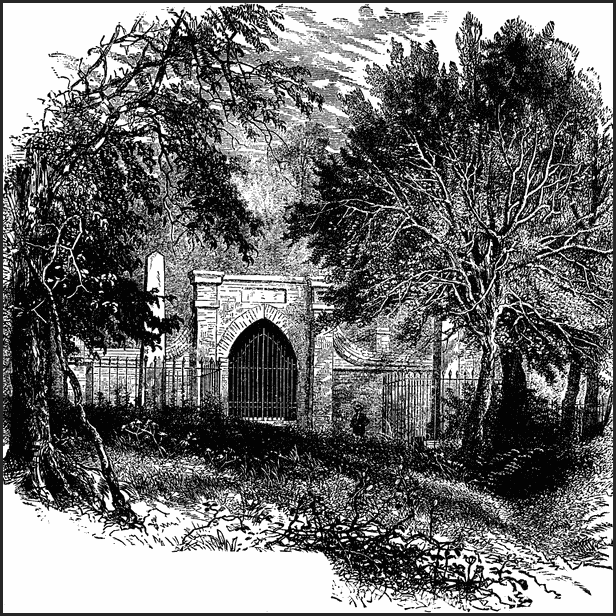 An illustration of George Washington’s grave at Mount Vernon from the ClipArt ETC website.